Remember I talked about salted egg yolk and gooey lava craze in Singapore’s F&B industry? Well, it has finally hit our local bakery scene of late from eastern liu sar bao to western croissants and now, Lava Cheese Tarts and a variant Salted Yolk Lava Cheese Tarts! Salted Yolk Lava Cheese Tarts. 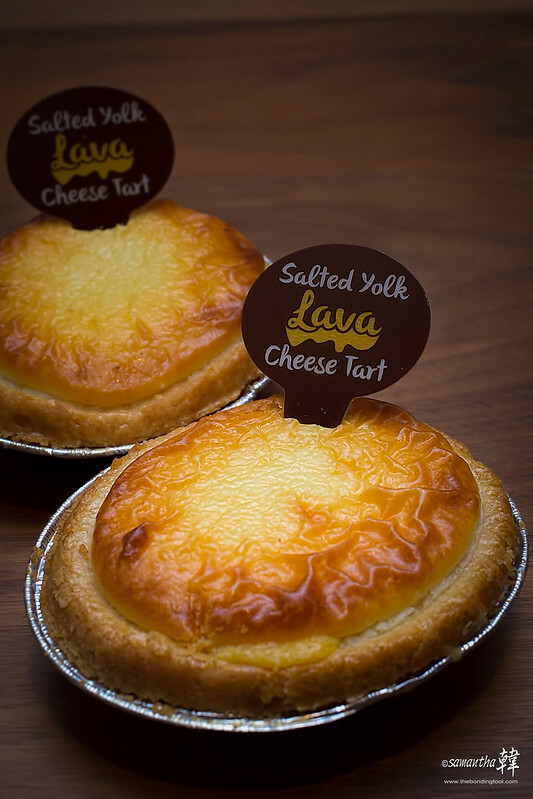 Launched on 8th April 2016, the Lava Cheese Tart is priced at $2.40 each and the Salted Yolk Lava Cheese Tart at $2.80 each. And from now till 30th April 2016, these tarts are offered at introductory prices of S$2 and S$2.40 respectively. There’s a Prima Deli outlet near us. This outlet only serves waffles cooked on the spot but the other items are made in their central kitchen and delivered to the stall in the foodcourt. Valerie and I were walking by that particular outlet when we saw its promotional poster already printed with a “SOLD OUT”. Prima Deli was pretty confident that their tarts would fly off the shelves as “engineered”. It always pay to have clever marketing tactics in addition to good products! “FIRST IN SINGAPORE – Salted Yolk Lava Cheese Tart! 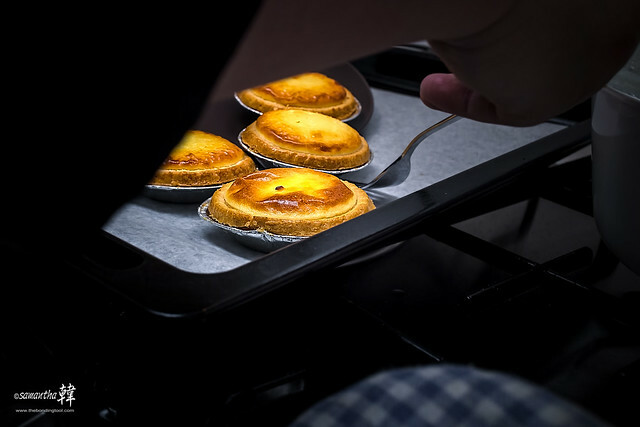 Building on the popularity of the baked cheese tarts that have taken Japan and Hong Kong by storm, we are proud to introduce our take on this mouth-watering treat! Rich & creamy cheese paired with molten salted yolk encased in melt-in-your-mouth buttery crust. Need we say more? You will fall in love with these tarts at first bite! These treats are also available in original lava cheese flavour. “Thank you everyone for your support! 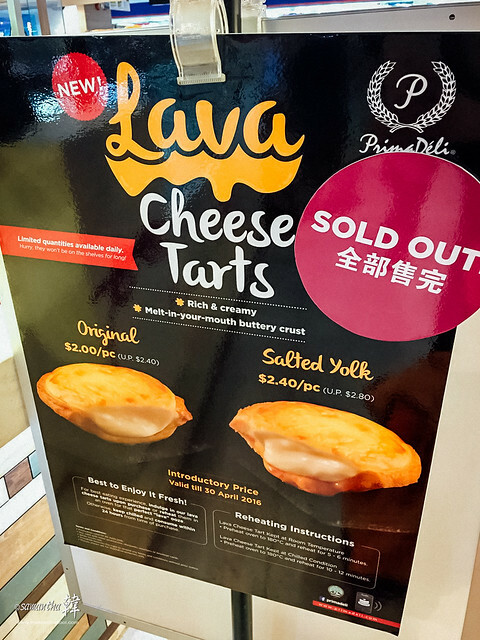 Due to overwhelming response, we are sold out of our Lava Cheese Tarts today. Please come back tomorrow for fresh tarts. While stocks last. Kindly be informed that availability differs at each outlet due to their staggered delivery timings.” – Prima Deli announced on their Facebook page at 6.23pm, 8th April 2016. At room temperature: 180°C for about 5-6 minutes. 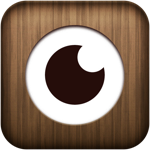 If chilled: 180°C for a slightly longer time of 10-12 minutes. Our tarts were not as “lava” nor “molten” as those posted by others but I am sure their essential tastes remained the same. Since the tarts were still warm when Vanessa brought them over, we gathered that a pre-heated oven at 180°C for about 5-6 minutes would do the trick but alas, we didn’t get the ultra flowing gooey-ness others had posted. Please don’t tell me that I was at fault because I took a few photos of them! Anyway, Vanessa got pretty excited when the buttery aroma wafted through the air as the tarts came out of the oven while Valerie sulked since she couldn’t eat them (TJ is highly allergic to cheese and Valerie is still giving him breastmilk). I took a few shots for this blog post and we began eating. How did the taste test fare? The Salted Yolk Lava Cheese Tart with creamy salted yolk custard atop the cheese filling had balanced layers of sweet and savoury flavours. Its delectable molten filling was revealed (didn’t ooze though) once we cut into the tart as shown in picture above. The Salted Yolk version passed the test. However, Vanessa’s pick is the Lava Cheese Tart Original, which featured the same luscious mound of tasty cheese filling in an almost-melt-in-the-mouth buttery shortcrust pastry that had been baked till golden with a slight caramelised finish. That said, I am not in a hurry to go out and buy it again. 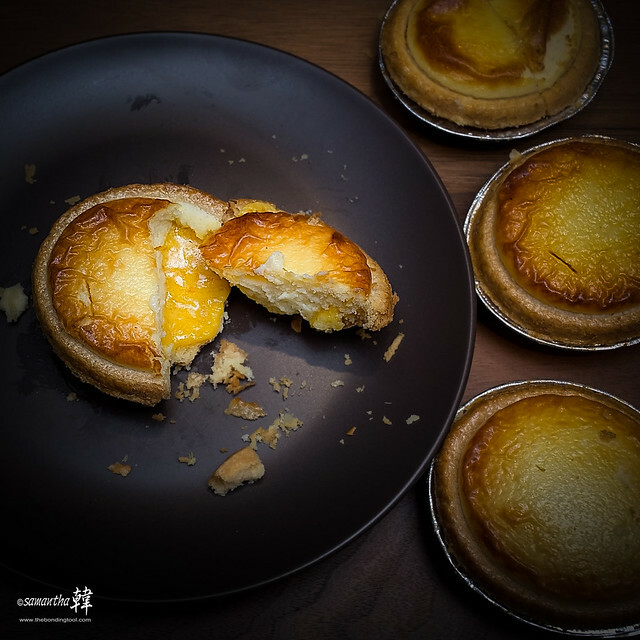 Don’t get me wrong, these tarts were delicious and indeed they passed our taste test with flying colours (jin jia ho jiak ah!) but the days of cheese cakes and cheese tarts are over for me. I don’t know… Maybe it’s the maternal guilt kicking in that since Valerie cannot enjoy them, I shouldn’t too. 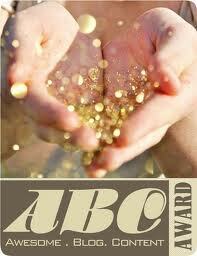 Who knows?!!! “jin jia ho jiak ah!” literally means “very nice to eat!”.